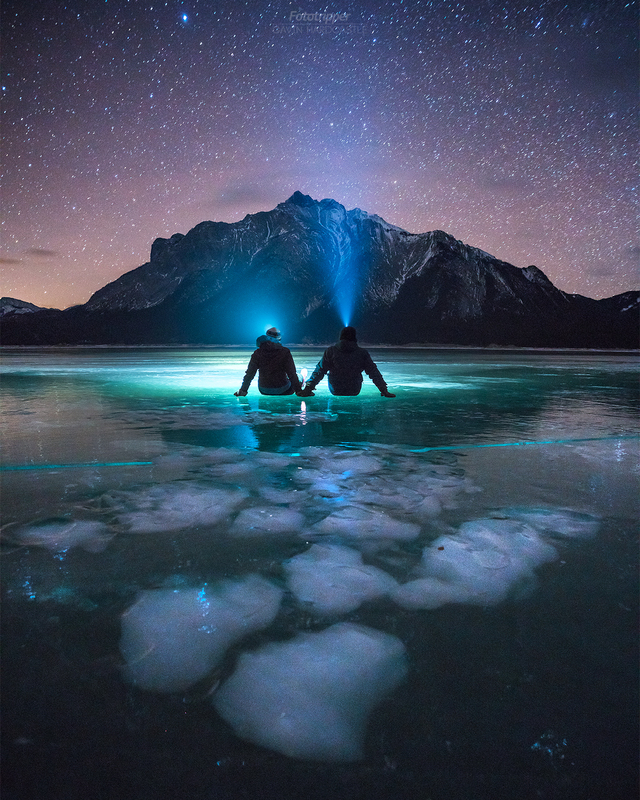 There’s a reason why we look slightly uncomfortable sitting there on the ice of Abraham Lake. The wind was so fierce we had to use all of our strength and balance just to stay put. This was one of the most frustrating images I’ve ever shot. Shooting 30″ exposures on slick ice under heavy wind was a total mare. After many attempts I’d noticed that all of my images had squiggly star trails because the wind was so brutal it actually made the ice vibrate. No amount of securing the tripod would improve the shot while the ice was quaking underfoot. Luckily my Sony A7RII camera has 5 axis stabilization on the sensor so in an act of hopeless desperation I thought I’d try it out. Setting the sensor stabilization to 18mm to match my Zeiss Batis prime lens fixed the problem brilliantly. I thought it was a long shot and didn’t really expect it to work but I was blown away with the results. Gone were the squiggly star trails and blurred edges. It just goes to show that when you’re tired, cold and feeling defeated, you’ve usually got one more shot left in you and it might just be the best shot of the night.